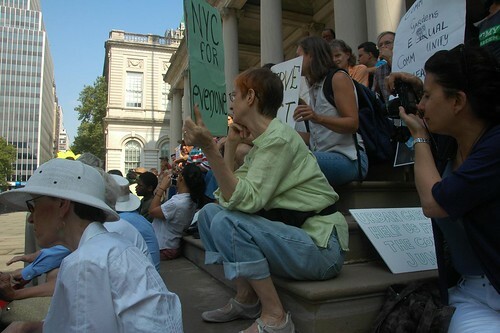 Garden supporters gathered on the steps of City Hall for last Wednesday's press conference. Today is the last day to register to speak at tomorrow's hearings on proposed rules that will govern more than half of NYC's community gardens. 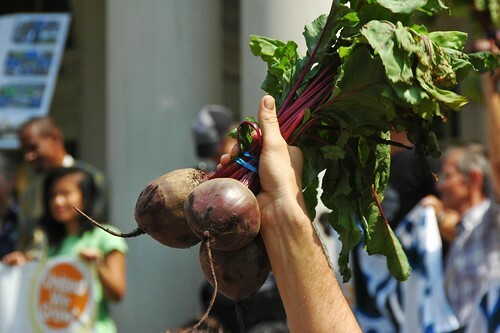 The New York City Community Gardeners Coalition (NYCCGC) has all the details on their Web site. The deadline for submitting written comments is tomorrow, coinciding with the public hearing. Many other groups are also joining together for rallies and other events to show support for NYC's community gardens. Even if you're not inspired to speak or write, please come out to show your support. Updated 2010-08-05: Added links to more reports on the press conference, variously reported also as a demonstration, protest, or rally. Yesterday morning, I joined about 70 of my fellow community gardeners and community garden advocates and supporters on the steps of City Hall. The agreement that has largely protected community gardens in NYC since 2002 expires next month. The press conference was organized by the New York City Community Gardens Coalition (NYCCGC) to draw attention to issues with proposed new rules for NYC's community gardens. NYCCGC has all the details on their Web site. I urge everyone to weigh in with written comments, whether submitted through the NYC.gov Web site, or by email. You can also (gasp!) mail a letter. You can even call 311. The hearing is Tuesday, 8/10. If you want to speak, you must register by Monday, August 9. All comments are due on or by August 10, the date of the hearing. Despite the heat, even at 9:30 in the morning, it was a lovely, energizing, and community-building event. The gardens were well-represented. The East 4th Street/Windsor Terrace-Kensington Veterans Memorial Community Garden, one of over 100 NYC community gardens under Parks jurisdiction. The agreement that has largely protected community gardens in NYC since 2002 expires next month. 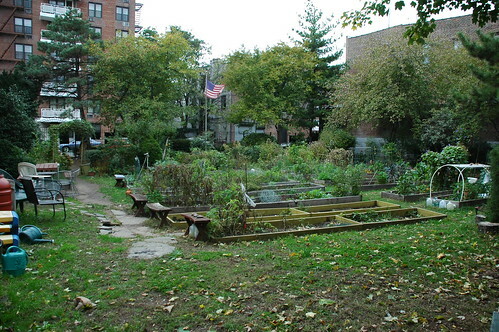 Brooklyn has 42% (204/483) of NYC's Community Gardens. Several community gardening advocacy groups are holding a press conference on the steps of City Hall tomorrow, Wednesday, August 4, at 10:00am. They are inviting all supporters to join them. The press conference is in response to the new community gardens rules proposed by the NYC Department of Parks and Recreation (Parks) and Housing Preservation and Development (HPD). @ NEW YORK CITY HALL STEPS - BE THERE! as we voice our concerns regarding the proposed new rules that govern many of our city's community gardens. This afternoon at 3pm I'll be presenting to the community drafts of two alternative designs for a new communal garden on the grounds of the Parsonage, a landmarked historic building, on the grounds of the Flatbush Reformed Church. Neither of these is a final design. They're intended simply to present key features requested by community members at the Visioning Workshops and show how they might integrate into a cohesive design. The two designs weight these features differently, giving more or less space to different areas, and supporting different activities. 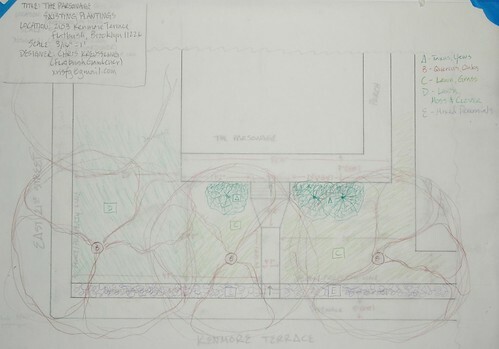 I'm hoping this afternoon's meeting will highlight the most popular features of each design, which can be recombined into a final design for this garden. Here's the base plan, drawn to scale at 3/16" = 1 foot, of the site. 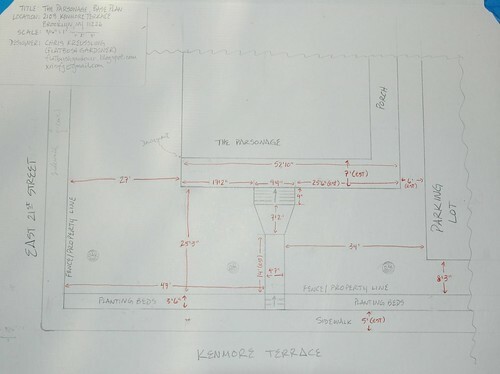 Kenmore Terrace is at the bottom of the plan, East 21st Street on the left, the parking lot on the right. North is roughly up. The front porch is nearly 53' long! It's just over 25' from the fence along Kenmore Terrace to the front of the porch, and 27' from the East 21st Street fence to the side. It's nearly 85' from the parking lot to East 21st. The sidewalk bed along Kenmore Terrace is 3'6" deep. The bed between the fence and the parking lot is 8'3" deep. The space is dominated by large, mature oak trees which provide high shade over the entire property. Three large Taxus, Yew, shrubs exist as foundation plantings in front of the porch. There probably was at one time fourth shrub, at the far left of the porch, to complete the symmetry. Everything else is lawn. Between the parking lot and the center walk, the lawn is sparse and the ground is compacted. To the left of the center walk, the ground is less compacted, and the grass transitions to a mix of clover and moss closer to East 21st Street. There are planting beds between the fence along the property line and the sidewalk. Existing plantings of perennials in these beds are scattered and sparse. This design maximizes space to meet, sit and play. A paved patio area is created between the center walk and the parking lot. Benches provide seating for over 20 people. A large expanse of lawn provides space for running around or lawn games, such as badminton, horseshoes, etc. Raised beds - 4x4 or 2x4 - provide over 200 square feet to grow food, herbs, and medicinal plants. The existing large Taxus, Yew, shrubs are preserved. A buffer of perennials is created around the trunk of each Quercus, Oak, tree. Rainwater is collected from the downspout near the western end of the porch (left in this rendering). 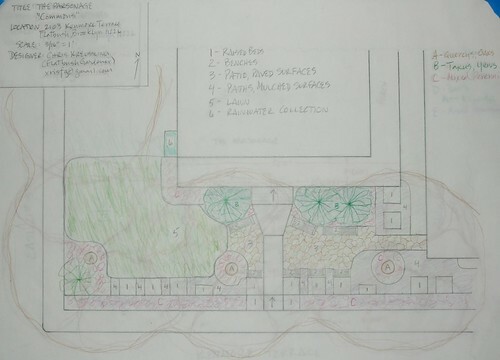 This design provides for both shared and intimate experiences in the garden. Three gardens are created here: a common area, a wildlife habitat garden, and a rain garden. The existing Yews are removed to make more room, especially for the common area between the center walk and the parking lot. A few raised beds are specified in this design in the common area. More space is available for raised beds to the right of this plan, between the parking lot and the fence along the property line. The common area has both a paved patio area and a small lawn for picnicking. A wide entrance and semi-circular bench around the base of one of the Oaks provides a generous invitation to enter and linger. No other seating is specified, but could be added, for example, on the ends of the raised beds. 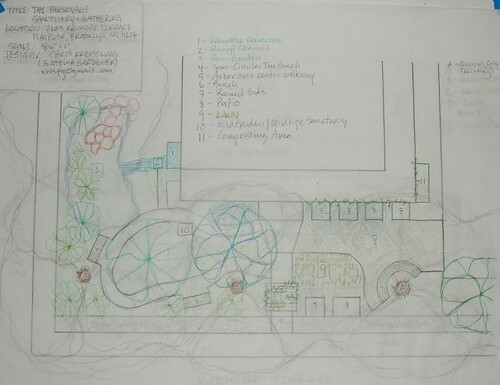 The wildlife habitat garden is contained with a meandering path. Two small understory trees provide focal points. These would be underplanted with small shrubs, and shade-loving perennials. The path is designed to both cutoff and provide access to this garden. You can't see everything without walking the path. Two benches provide intimate seating, out of sight of each other and other areas of the garden. Rainwater is collected from the downspout near the western end of the porch (left in this rendering). Here, a "stream" is designed to direct overflow to the rain garden. This would be planted with native shrubs, ferns, and wildflowers.